Update: Palm has officially confirmed that the Pre will sync with iTunes 8.1.1 on Mac OS X and Windows XP/Vista. Ever since the launch of the iPhone, we’ve seen a cornucopia of purported “iPhone killers” come and go. Although each of these phones were heavily inspired by the iPhone, none of them had what it took to unseat the reigning champion. But then competitors like the Android-based T-Mobile G1 and the Palm Pre appeared onto the scene, and it now looks like the iPhone may face some real competition. 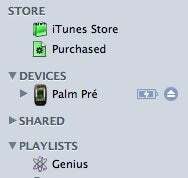 A preview of what the Palm Pre might look like when attached to iTunes. The Palm Pre, in particular, seems to borrow (and perhaps even improve upon) a lot of the iPhone's features. So much so, in fact, that not only does it sport a single button on the front (at least, until you slide out the keyboard), Multi-touch gestures, and a dock similar to the iPhone’s (and Mac OS X’s), it reportedly syncs with iTunes as well. According to a post by Fortune's Philip Elmer-DeWitt, iTunes actually recognizes the Palm Pre out-of-the-box and pretty much treats it just as it would a regular iPhone or iPod. As you might expect, the Pre can't play the DRM-protected songs bought during the pre-iTunes Plus era. Given that Jon Rubenstein, a former Apple hardware executive, now leads the team that built the Palm Pre, it isn’t as much of a surprise as you might expect. And iTunes has long supported MP3 players not made by Apple. But still, it's an encouraging sign that the Pre may be an iTunes- and possibly even Mac-friendly product when it ships in June.